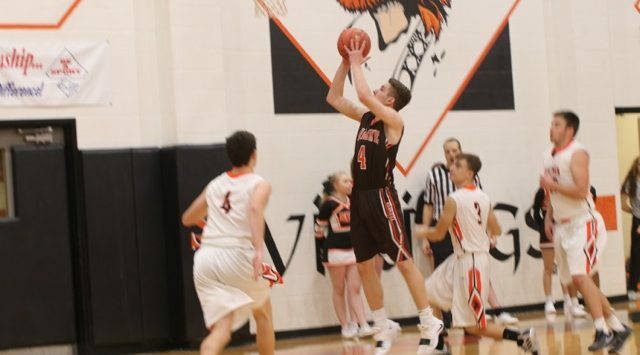 The Abilene High School Basketball Teams continued their mastery of Smoky Valley Friday night with a pair of wins in Lindsborg. The Cowgirls used a 22-3 third quarter to pull away to a 50-23 victory over Smoky Valley. It was the Cowgirls 13th straight win over Smoky Valley. The Cowboys outscored the Vikings 27-15 in the final quarter to pull away for the 69-56 victory. It was the Cowboys 16th consecutive win over the Vikings. The victory wasn’t easy for the Cowboys, they trailed for nearly all of the first three quarters of the game. Smokey Valley led 14-11 at the end of the first quarter and 26-25 at halftime. The Vikings could never pull away though, they never led by more than five points in the game. Abilene grabbed their first lead of the game with 5.8 seconds left in the third quarter on a free throw by Freshman, Kaleb Becker, he gave the Cowboys a 42-41 advantage going into the final quarter. Becker finished the night with 10 points in his debut. In the first game of the night, the Cowgirls were led in double figures by Seniors, Hannah Willey and Sydney Burton. Burton finished the night with 17 points, while Willey totaled 14 for Abilene. Abilene will open at home next Tuesday night against Rock Creek. The Rock Creek girls lost at Clay Center 50-18 Friday night, while the Rock Creek boys defeated the Tigers 78-70.